The best type of appetizer - easy and insanely delicious. Note: You can use premade tempeh bacon or make it. I used plain tempeh, sliced long-wise into 18 strips, and tripled the amount of an online marinade (http://kblog.lunchboxbunch.com/2009/06/tempeh-bacon-recipe-vegan-facon-makes.html). Dip one spring roll wrapper at a time into a bowl of water, just until pliable. 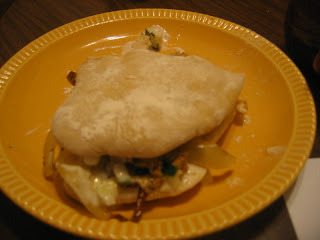 At the center of each wrapper, place a strip of tempeh bacon. On it, place one asparagus spear, snapping off the woody end so that the length of the asparagus matches that of the tempeh strip. 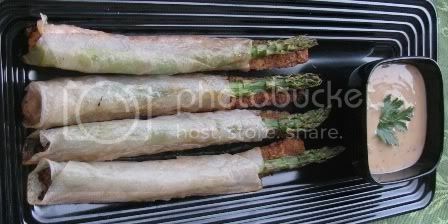 Roll the spring roll wrapper around the tempeh and asparagus and place on a well greased cookie tray. Use a liberal amount of oil, which helps the wrappers not stick and also helps the bottom of the wrapper get crispy during the baking process. Bake for 15 minutes. Serve with goddess dressing or homemade tahini sauce. Wearing gloves, slice most of the way down the length of one side of each jalepeno, leaving the stem attached. Remove the seeds and rinse the inside of each pepper. Stuff each jalepeno with mashed avocado. Pour milk into a small bowl. In another small bowl, combine nutritional yeast, seasoning blend, and salt. With one hand dip each pepper into the milk. 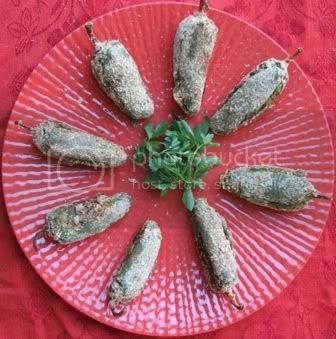 With your other hand, roll each pepper in the nutritional yeast mixture. Place on a cookie sheet and bake for 40 minutes at 350 degrees F.
The peppers are still quite hot the first day. If refrigerated overnight, the heat mellows, but the peppers soften. If serving the following day, reheat for 30 minutes at 350 degrees F or fry them in hot oil until they are golden brown. Use your favorite potato salad recipe. Chop the ingredients smaller to fit the smaller scale of the new potatoes. This is a great make-ahead travel recipe. 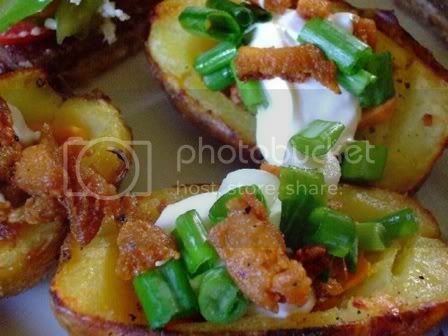 The potato skins stack and you can place the filling in a plastic bag. When you arrive at your destination, cut a corner off of the plastic bag and squeeze the filling into the shells. Steam or boil new potatoes. If boiling, add 1 teaspoon of salt to the water. If using red, white, and blue new potatoes, the blue new potatoes require extra cooking time. When the potatoes have cooked, remove them from heat and allow them to cool. While they are still warm, cut them in half, lenthwise, and scoop out the potato pulp with a melon baller or cookie scoop. Chop the potato pulp and place it in a bowl. To the bowl, add the mayo, celery, bell pepper, onion, black olives, vinegar, salt, dry mustard, and pepper. Gently fold the ingredients until well blended. 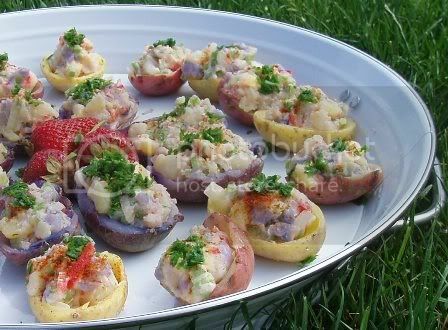 Place the shells on a serving tray and fill with the potato salad mixture. Top with vegan bacon bits or finely chopped parsley or paprika. Preheat oven to 425 degrees. Scrub potatoes, dry, and rub with olive oil, and salt. Place potatoes on baking sheet, and bake at 425 for about one hour, or until thoroughly cooked. If you want to do a quicker version, you may cook the potatoes in the microwave. Leave the oven on (or turn it on, if you used the microwave method, and turn to 450). While the potatoes are baking, prepare your bacon. Heat canola/safflower/sunflower oil in nonstick pan. Chop the frozen, thawed, and squeezed tofu into small cubes/pieces. Add the tofu to the oil, and occasionally stir around until totally fried, golden, and crispy. Meanwhile, mix the soy sauce, liquid smoke, and some pepper (this is the "bacon" recipe from vegweb, that I modified). After the tofu is done, take the pan off the heat, and add the liquid mixture. You need enough to cover every piece. If you need to cook off some liquid, put the pan back on the heat for a few seconds. After most all of the soy sauce mixture has been absorbed, sprinkle in the 2 tbs nutritional yeast, and stir around. Put this off to the side. Continue to check your potatoes, and once they are done, set them off to the side (off of the pan, for quicker cooling) and let them cool enough to handle. You may chop your green onions while you wait, or mix up your nutritional yeast sauce, if you are using that for the cheeze. Once you are able to handle the potatoes, slice them each in half, lengthwise. Using a tablespoon, scoop out the very middle of the potato, and save it for later. For crispier skins, scoop out more potato. I like to leave about 1/4-1/2 inch of potato along the edges of the skin. Spray a bit more olive oil onto the tops of the potatoes, and sprinkle with pepper (you may also sprinkle with salt, but I usually have a good layer on the outside). Place the skins back in the oven for 10 minutes, then turn over, and bake 10 minutes more. Once they are done, and crispy, take them out, and assemble! Once again, leave the oven on, and turn to broil. Add a piece of vegan cheeze slice, or about 1/2-1 tbs nutritional yeast sauce to each potato, and place in broiler for a couple of minutes. You may also use vegan sprinkles, or whatever cheeze you like. Take the pan out, and add a generous sprinkling of tofu bacon crumbles, a dollop of "sour cream," and a sprinkle of pepper, and green onions. Yum! It sounds weird... but it's not, I swear. Totally regular salsa here. Mostly. Of course the directions are... combine everything in a medium bowl. Let sit for at least 15 minutes before serving with chips. Heat oil to 180 C / 350F. Drain the soaked cashews. Mix flour, nori, salt, pepper and paprika in a bowl. Add water and whisk until smooth. Stir in cashews. Drop one at a time (so they don't stick together) into hot oil and fry for 2-3 minutes, or until golden. Drain on paper towels. Serve hot. This is a vegan version of the Americanized version of Sweet & Sour Pork. If you want a more authentic Chinese version, don't make this one. Drain pineapple, reserving juice. Set aside pineapple rings, combine remaining ingredients (including pineapple juice...there should be 1/2-2/3 cup of juice), and simmer or microwave until thickened. You can add some red food coloring if you want that unnaturally bright color you see at restaurants. *Disclaimer: This sauce is a little more sour than sweet. If you want it sweeter, decrease the vinegar and/or add more sugar to taste. Cut seitan into 1-inch chunks. Fill a pan about 3 inches deep with oil and heat to 375 F/185 C (if you happen to have a deep frying thermometer. Otherwise, just guess). Whisk together the self-raising flour, water, and salt. Toss seitan pieces in flour, then dip in batter and fry in batches until golden, about 2-3 mins per batch. Remove with a slotted spoon and drain on paper towels or a wire rack. Roughly chop the pineapple and green pepper and slice the carrots. Stir fry on medium-high until hot but barely cooked. Spoon veggies over rice, top with "pork", and pour sauce over all. In a medium bowl, whisk together the soymilk and cream cheese - there will still be little bits of cream cheese, but it should mostly mix. Set aside. Sauté the onion and celery in 2 Tbsp of the Earth Balance over medium-low heat until soft and lightly browned. Add the sage and "ham" and sauté until fragrant (about 1 minute). Add the rest of the Earth Balance and flour to make a roux. Once the flour has been lightly toasted, add the water, dashi seasoning, and potatoes, and bring to a boil. Turn down to simmer (and stir often to prevent the flour from burning), until the potatoes are soft, about 10 minutes. Add the soymilk/Tofutti mixture and oyster mushrooms. Return to a boil and then simmer for about 10 more minutes, until the mushrooms are soft and the soup is thick. Add salt to taste, and garnish with chives. For an even "fishier" flavor, you can add flaked dulse to taste at any point in cooking. * recipe for home-made dashi stock: http://japanesefood.about.com/od/soup/r/konbudashi.htm If using this, use the same amount of kelp but only 2.5 cups water (not 4 cups as stated) to make a more concentrated broth. Sautee onion and Seitan in a pan with poultry seasoning and just enough OLIVE OIL TO COVER pan. wash and drain beans. add to Seitan and turn off heat. Meanwhile, dice tomato and mix with just enough Olive oil to cover them. add BBQ sauce and more seasoning to taste. Once tomatoes have gotten mushy, add beans to tomatoes and stir over medium heat until combined.